A monk and the abbot of a Mt Athos monastery have been found guilty for crimes that will see them serving prison time if they are found, sources have reported. Antypas and Monk Methodios of the Mt. 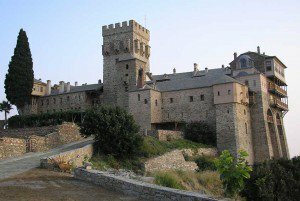 Athos monastery have been sentenced by a Greek court in northern Athens in absentia to 20 years. The convictions are following events in July 2013 when Methodios threw firebombs at police trying to evict him and others from a building in Karyes and Antypas was convicted for incitement at the same event. Their whereabouts are unknown. Another six monks were also sentenced to 10 years as accessories in the crime and have been released on parole.